Showcase Miniatures in Alabama has manufactured very high quality cast metal kits and details since 1995. 2018 marks the year of their first own N Scale figure. 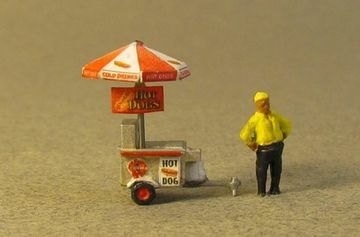 Catalog number 526 is Bart's Hot Dog Cart, which comes complete with Bart. Photo from Showcase Miniatures. Showcase Miniatures is now also selling the four engineer/fireman sets previously offered by Labelle/Con-Cor, with the same SKU numbers (last four digits). Showcase Miniatures has their own online store.